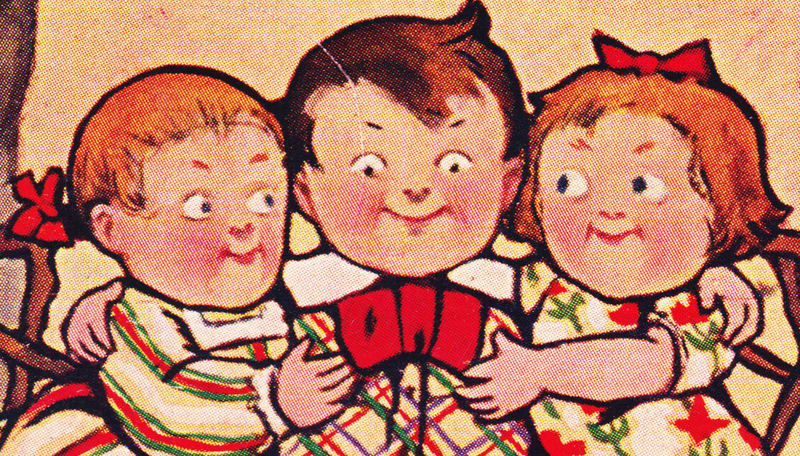 This past Tuesday, I presented a mystery to Papergreat's readers in the form of an old black-and-white postcard with no identifying information whatsoever. The city looked European. There was a horse cart. A woman in a knee-length dress. And some buildings. That's it. In less than 13 hours, someone came up with answer. Shown above are the original postcard and an August 2010 photo by Hermann Luyken from the Wikimedia Commons. 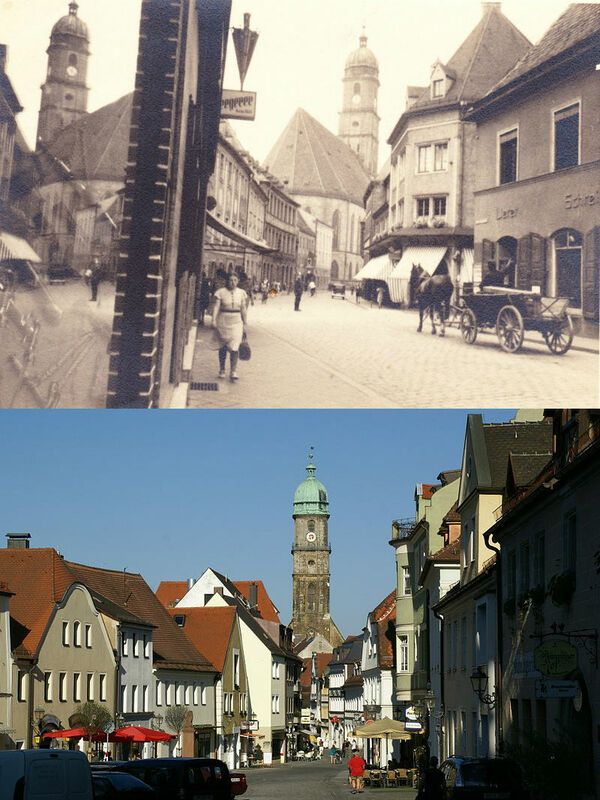 The town in both pictures is Amberg, Germany. Bonnie Jeanne (aka PostMuse): I posted this to my Facebook page and I think my friend Sarah found it! Amberg, St. Martin Church, I don't know how she did it, but it seems to be the location! I'm thinking it is 1940s. ... 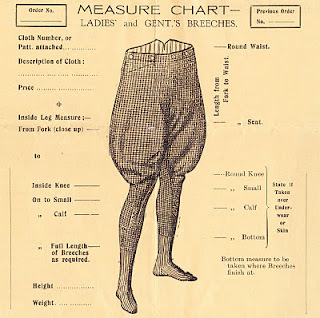 The horse and buggy look out of place, but can't be much earlier with the skirt that short." Sarah: "I submit that the town is Amberg, Germany, and that the church in the background is St. Martin's. ... I found it by Googling the names on the building, and then following up on some current listings for a bookstore in Amberg. Then off to Wikipedia and Google Maps to confirm!" PostMuse: "It looked familiar because I'm pretty sure I passed through this town on my way to Regensburg years ago." Such wonderful internet detective work! Thanks to both of you for taking the time to dive into this mystery. Bringing ephemera "back to life" in this way is one of the main reasons I love doing this. I also love it when a family connects personally with ephemera that gets posted and discussed here. 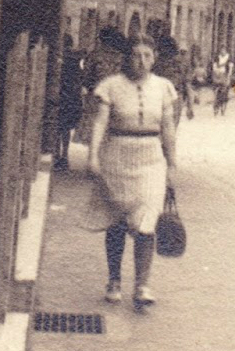 Kerry McIlwain writes: "This was my grandfather's shop! Lovely to find this!" And, shortly after Kerry's note, this came from an anonymous commenter: "My late husband, J.C. Savage, was a teenager when shop closed after the war when business was badly affected. I have some memorabilia from shop including name tags, which I used for my son when at school (also J.C.Savage). Have cheval mirror from shop and photos from satisfied American customers. Was told General Patton was one of them." 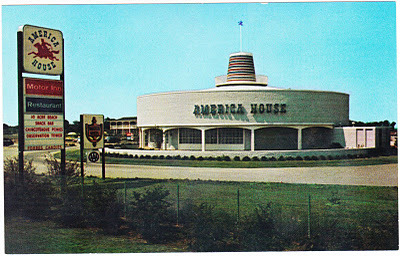 Saturday's postcard: America House Motor Inn: Anonymous writes: "I'm happy to say that the America House Motor Inn is still in business and is now called the Sunset Beach Inn and Grille. I've stay at the motel many times since the early 1970s, it's always been one of my favorite getaway spots. I haven't been back for several years, so I don't know what it's like today, but whenever I visited it in the past the rooms were always very clean, the food was good in their restaurant and the staff friendly. The Kiptopeke/Cape Charles area is a great place to kick back on a weekend getaway. Not much to do but enjoy the scenery and small town life." Pennsylvania Dutch recipe for funeral pie (aka raisin pie): Valerie Rankin writes: "I remember my Grandmother making a raisin pie as a kid (she was an award-winning pie baker). I hated the pie. Hey, I was a kid. I don't remember the sweetness, but I do remember the texture of the raisins. I'm thinking of making the pie, just to make it. It does look really sweet. What do you think, 3/4 cup of sugar?" 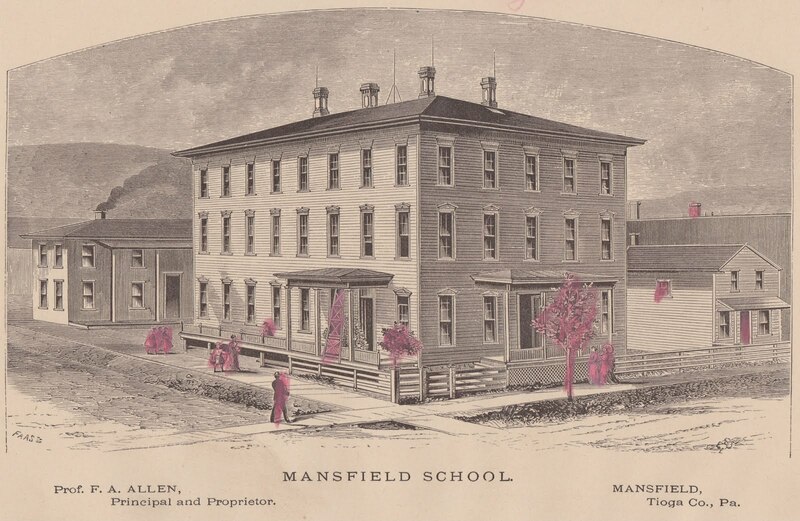 Illustrations of Pennsylvania's orphanages, circa 1880: Jill writes: "Thank you for taking the time and initiative to do this. This piece of history should not be lost. I am interested in researching this further and appreciate your efforts to contribute. It is only through people like you, who sometimes hold valuable gems of our history, who selflessly offer them to the public, that we are able to preserve what otherwise might be lost forever." Family Circle's "Most Beautiful Christmas Tree" of 30 years ago: Previously, Gary Bowers left a short note to say that he was excited to see his family Christmas tree on Papergreat more than three decades after the fact. He followed up with a little more information: "There is a story here about the tree. Actually my wife decorated the tree but it was already up when the photo contest was posted in the Family Circle Magazine, therefore it was our annual tree. Much more could be said. My wife was thrilled to know after all these years, there was an interest. Our local newspaper ran a story the following Christmas with the entire front page with our tree. It was awesome." 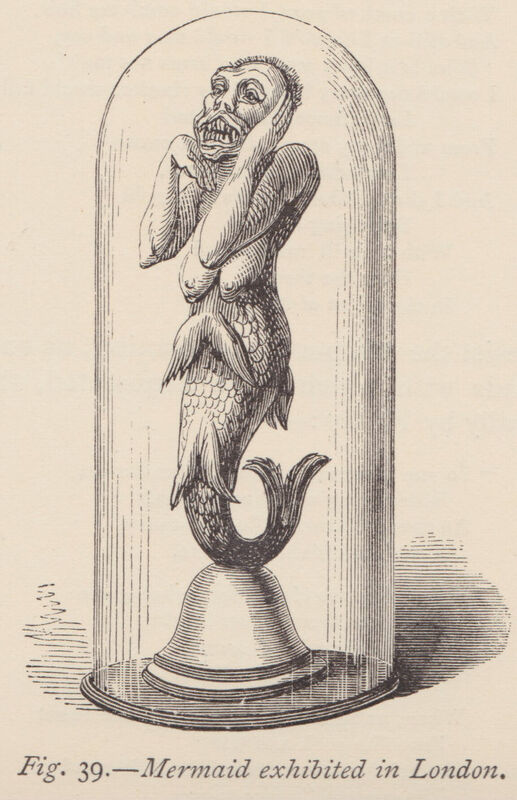 "The Mermaid of Legend and of Art" (The Art Journal, 1880): Shloime writes: "The Animal Planet TV show about mermaids references a P.T. Barnum poster for a 'real mermaid' display of 1865 (NOT the 'feejee mermaid'!). Is there any confirmation of the provenance of this poster (or even of the P.T. Barnum show that was cancelled) from an independent, reliable source, prior to the (2012) TV show?" Illustrated postcard mailed in 1907 and a bat stamp from Latvia: Anonymous writes: "I guess there's no clue as to the artist who drew the 3 kids ... because they sure look a lot like an early version of the Campbell Soup Kids."